Good. 8vo-over 7¾-9¾" tall. pp. 170. Good reading copy, pages clean and unmarked, tightly bound, spine unbroken. Normal age-wear-pages yellowing and foxed around edges, cover has some minor chipping/curling at corners. Previous owner's sticker/writing inside front cover. Classic and influential novel from 1936, now 'recognised as one of the works that has changed the climate of the written word. ' T.S. Eliot wrote "What I would leave the reader prepared to find is the great achievement of a style, the beauty of phrasing, the brilliance of wit and characterisation, and a quality of horror and doom very nearly related to that of Elizabethan tragedy". Barnes is also now regarded as an icon of lesbian writers as one of the first women who wrote openly about love between women. Very Good. 0571209289 ALL BOOKS SHIPPED WITHIN 1 DAY OF PURCHASE! first of all the book is in itself a timeless masterpiece,but this edition goes further and points at the orginal genesis of the novel,and second,the book is in great condition and is a true marvel to own. I bought this book because it was on my list of lists. A guide I use to give myself a little more focus in my hunt for good literature. It is a tiny book that had received some great praise. Don?t you believe it! This book is horrific, unless of course you need a sleep aid. 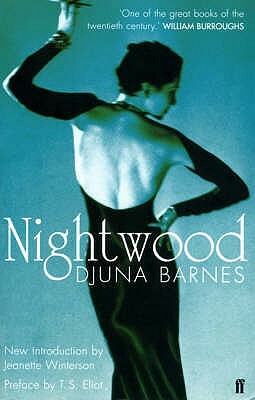 Even the slow paced detailed writing of James Fenimore Cooper could keep me awake, but not Nightwood. In the years that I have had this book, and attempted on many occasions to read, I have made it only to page 25, in a book that has approximately 60-70 pages.. And that was after rereading page after page because after a paragraph or two I?d start falling asleep. I thought it was just me, until I asked my older brother, who reads everything, cereal boxes, owners manuals etc. He couldn?t read it either. Same problem, it puts him to sleep. It wasn't that it was hard to follow, it is just dull. I have admitted defeat. Hopefully you will heed my words and not have to do the same.